If you've done time in advertising, you know advertising award shows are nothing more than ego boosters for our fragile personas and a chance for us to get a group hug from our fellow industry mates. The Phoeniz Addys aren't trying to hide this truth with their call for entries promotion called Ego Stroke 5,000, a device that sends ego boosting thoughts into the brain. Of course it's just a cheesecake pan with a bunch or wires attached but it does the job. The promotion was created by Riester~Robb. 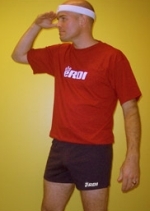 In some weird ode to the seventies (or was it the eighties), emarketing company eROI has created a silly little site called WearShortShorts on which office co-workers do, well, strange things while wearing short shorts. we guess this is some form of viral attempt at driving traffic to the company's website. Or, it's just a bunch of advertising wackos, sick of their client's ridiculous requests, letting off some steam. Other than that, we don't know. Oh wait, there;s a store that sells the short shorts, a t-shirt and a headband so you can fully don the idiocy of seventies cool. 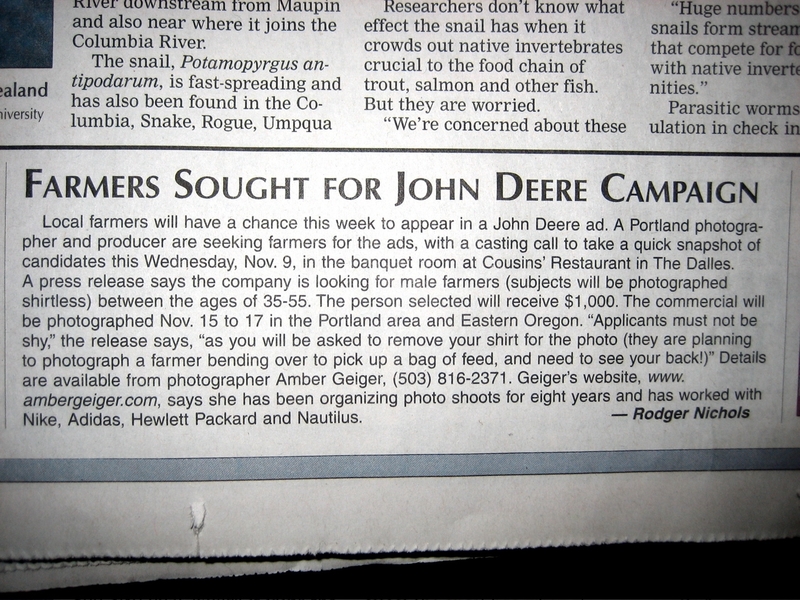 Minneapolis-based John Deere agency Mackenzie is looking for farmers for an upcoming John Deer ad campaign. The agency wants "real farmers, with farmer tans, well-formed paunches, and tattoos." A newspaper article states male farmers will photographed shirtless and should be between 25 and 55. There was no mention of 35 to 55 year-old, shirtless female farmers. Yesterday, ad agency The Gate Worldwide ran an ad in The New York Times which killed a bunch of advertising sacred cows such as "Never say something offensive in a headline," Clients should be charged based on hours worked" and " It's OK to act like a jerk if you're talented." The ad, which carries the headline, "Death to all sacred cows" along with the image of a cow with a gun pointed at its head, goes on to explain the agencies compensation system which involves three levels; idea compensation, commodity-based execution and a bonus structure that rewards both agency and client. It also impresses upon potential clients the importance of properly selling a proposed idea up the client side ladder which, if accomplished efficiently, can result in the agency offering a discount for time and money saved. It's not that these ideas are new but they are just packaged so well that it's worth calling out. The agency's website includes seven "gateisms" offered as guiding principles for great advertising. George Mason University student Rana Sobhany, 19, following the launch of three other companies beginning at the age of 17, has launched Inchoate, a marketing, PR and advertising firm in Springfield, Virginia. Her prior companies dealt mainly with music and she intends to focus the new company in that space as well offering services to clients such as recording studios, record labels and individual artists as well as nightclubs, music retailers and universities. She's currently working with George mason University to educate both the administration and students on the subject of peer-to-peer file sharing. For the launch of Minneapolis-based Pocket Hercules, the agency created a film which portrays the big holding companies and a bunch of overlording control freaks who are about the get the crap beat out of them by a new breed of smaller, more nimble agencies, namely Pocket Hercules. in the new world of advertising. Funny stuff. And, no doubt, more coming from that direction as holding companies loose touch with reality and become irrelevant. And that's just one of the ads in this week's Ad Age TV Spots of the Week column. 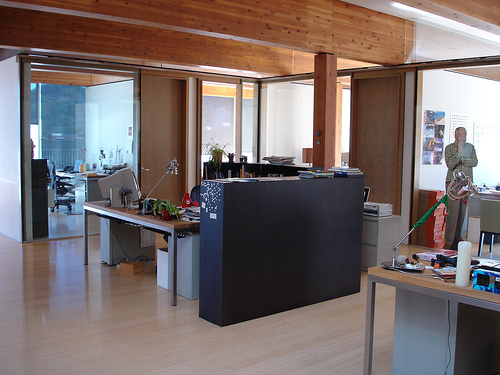 We have to admit, the Portland Oregon offices of Wieden + Kennedy are certainly much nice than their website. Check out the digs here. Not a bad place to hang out all day. In a Slate article Seth Stevenson ponders the notion Burger King agency Crispin Porter + Bogusky orchestrated the Burger King Halloween mask hype which involved emails inquiring where the mask could be bought, a thread on Fark in which the mask was parodied and a BK Masks site was launched by CP + B around the same time. Coincidence? We don't think so. Adrants reader doesn't think so either and wrote us, "Lets say CP+B were the farksters of the King. Funny, but is it legal? Can an agency Fark a marketing tool, and then profit by selling masks for Halloween? Although a bit shiesty, this seems to bob and weave around any kind of direct profiteering via manipulated personal likenesses, intellectual property, etc. But sending faux-inquiries about the masks to Slate? I realize that the inquiries where only that- inquiries, not hard sells. But the level of shrewdness here gets under my skin. I know this isn't anything new; advertisers have been playing the fool in chat rooms for years. But Slate is a major news source. It makes me angry." Anyone want to add their comment?